YouGov have published the results of an opinion poll they conducted on behalf of the Sun asking people about their views on drug policy. Interestingly younger people are more likely to feel that the government’s policy has been reducing drug use than older age groups – 21% of 18-24 year olds said they felt the policy had been going well compared to 11% of 40-59 year olds and 13% of those over 60. Also of interest are the different reaction of different regions with Londoners being much more likely to think the policy has been working (18%) to those in Scotland (7%). 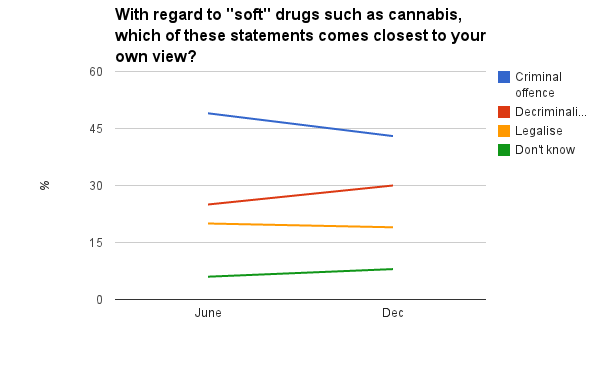 In terms of what to do about controlling cannabis (and other ‘soft’ drugs) the public seem split with just under half (43%) favouring the current position and the other half (49%) favouring either decriminalisation or legalisation. Since YouGov last asked these questions in June there seems to have been a move away from the current regime and a slight increase in those favouring decriminalisation. In terms of ‘hard’ drugs such as heroin and cocaine the mood seems to have gone the other way with an increase in those saying they favour the current criminal penalties for possession, up from 79% to 83%. 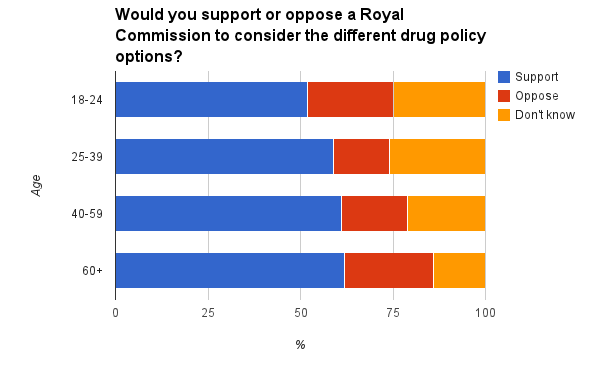 The poll then turns to the main recommendation made by the Home Affairs Select Committee, that the government set up a Royal Commission to consider different drug policy options. The public seem well disposed to the idea of doing this by a 3:1 margin, but there are some interesting differences when looked at by age group. It is younger people who are much less likely to offer support for a Royal Commission, but it appears that this may be because they are less certain of what a commission might be able to achieve. Another aspect of this poll may explain why politicians are responding in the ways that we have seen to the idea of a commission. The poll finds that Conservative voters are much less likely to support a Royal Commission (59%) compared with their Lib Dem counterparts (75%), with Labour’s supporters in between (62%). The final questions are about introducing a regulatory regime similar to Portugal’s and here it appears that support is waning, both in terms of limited trails (down from 60% to 54%) or adopting the same approach across the whole country (down from 46% to 40%). The Home Affairs Select Committee have published their report into drug policy. Given the comprehensive nature of what they cover it’s not that surprising that the media attention has been on the most controversial recommendation, that the government should constitute a Royal Commission to consider whether to move to a regulatory regime that is similar to the one that Portugal has in place – in other words the decriminalisation on possession. What has not had any focus is what the committee has to say about our area of expertise; education and prevention. Here they have been just as radical and I think we can say that our evidence to the committee – both written and verbal – have been influential in the committee’s thinking. It is surprising that apparently cost-effective programmes to dissuade young people from using drugs — Life Skills Training, Unplugged or Preventure—are not more widely used in schools. While we do not wish to endorse these particular programmes over others which might be equally good but were not drawn to our attention, we believe that there is a compelling case for the use of behaviour-based interventions in schools which are proven to reduce the chances of young people taking drugs. The Department for Education told us that the National Curriculum requires infant school children to be taught about drugs as medicines whilst junior school pupils are taught about the impact of alcohol, tobacco and drugs on the human body and how they can effect health as well as what drugs are legal and illegal. Strangely the DfE don’t seem to have mentioned that all mention of drugs have been removed from the draft of the new primary curriculum that the government want to introduce. It goes on to quote Mentor extensively, pointing out that much of what is taught hasn’t proven effective, and picking up on the need for prevention science to play a greater role in the drug strategy and the report specifically mentions four evidence based programmes; the Good Behaviour Game, Life Skills Training, Unplugged and Preventure – all of whom Mentor discussed in our evidence to the Committee. When we asked the Department for Education how often either of these programmes [the Good Behaviour Game and Preventure] along with two others—Life Skills Training and Unplugged—were used in schools, we were told that they “do not monitor the programmes or resources that schools use to support their teaching.” We contacted a number of local authorities and asked them to survey the secondary schools in their area, asking them whether they used Life Skills Training, Unplugged or Preventure. None of those that replied used any of the programmes. The report goes on to quote our evidence about the relatively small cost of delivering these sorts of programmes against the much larger overall cost of education and the huge costs associated with lifetime problematic drug use. 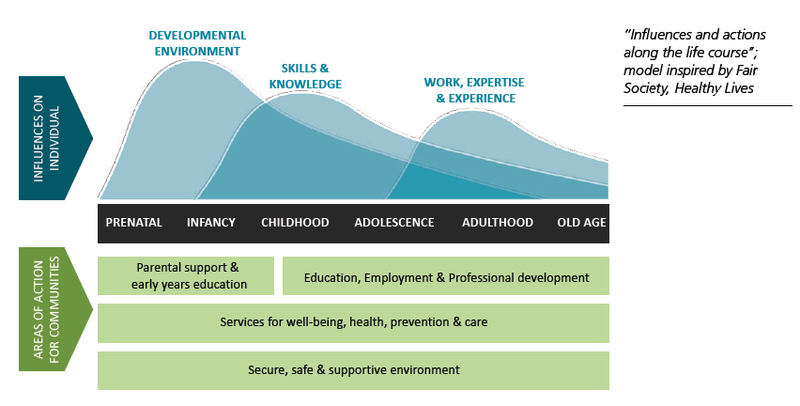 the next version of the Drugs Strategy contain a clear commitment to an effective drugs education and prevention programme, including behaviour-based interventions. 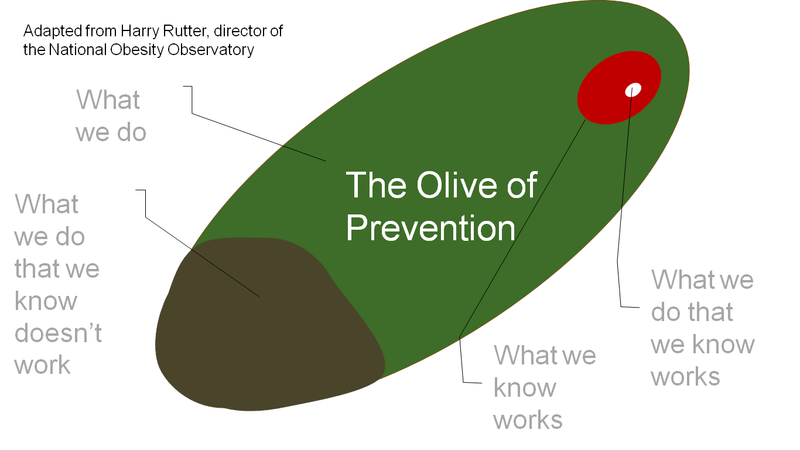 Public Health England commit centralised funding for preventative interventions when pilots are proven to be effective. Both of these recommendations are very welcome and if accepted by the government could lead to significant change in the way that young people in England are supported and protected from the harms associated with drug misuse. I don’t think we could have asked for a clearer endorsement of our position and the evidence we supplied the Committee was clearly influential in their thinking about this section of the report.